In the space of this weekend, I did 2 loads of washing, semi-cleaned the house, made 2 dinners, visited 3 festivals, and made 2 cards. On Saturday, we went to the Nicholson St Public School Halloween festival, which was filled with creepy vampires and skeletons in trees. And also lots of children dressed as witches . On Sunday, it was off to the Norton St Festa in Leichhardt, which had lots of cute Fiat cars and coffee stalls. The fine weather really brought out the crowds who were appreciative of the Italian cooking and concert in the Pioneer Memorial Park. Then, it was off by bus and train and mini-bus to the Danks St Festival in Waterloo. This had lots of dogs and art galleries, topped of by long queues at the many food stalls (I ate a great lamb souvlaki followed by a palmier and a bit of blood orange meringue). It also had a mini design mart that sold textiles, jewellery and artworks. By the end of it, my feet were killing me. So where are the photos, you ask. Well, I accidentally deleted them from my camera card before I copied them to the computer. D'oh!!!! In order to keep the post colourful, here are the cards I made. They were made at the request of my aunt, to give to a friend celebrating a birthday, and for a couple who are having their 50th wedding anniversary. 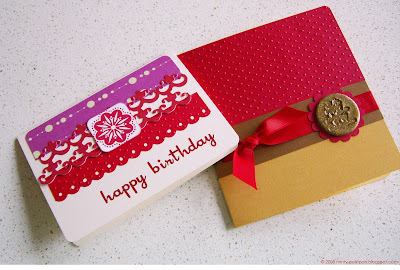 The birthday card features a Stampin' Up stamp in Real Red ink (it worked real well on the Whisper White card), and lace cardstock. 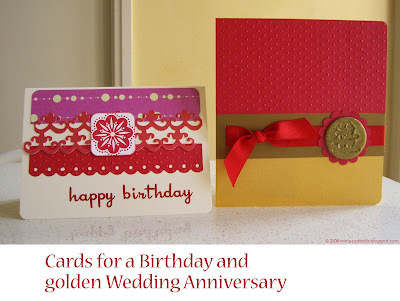 The anniversary card has a 'medallion' made from about 8 layers of ink, gold embossing powder and heat embossing that was then stamped with a double happiness stamp. And good ol' cuttlebug Swiss Dots on the red cardstock. Hopefully next weekend is as productive. And hopefully I won't accidentally delete evidence of it! Wow, I love the Happy Birthday card! Great color combo! Thanks, Karin. I love your painted watercolour cards! Fantastic cards, Belle! 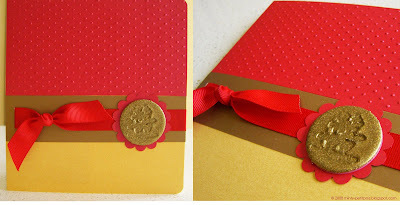 Great medallion - I would love to have a double happiness stamp! hi lin mei - the double happiness stamp is surprisingly versatile (depends on how many weddings you go to!). My stamp is from Hero Arts.